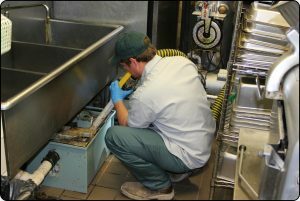 Flow More Sewer Services, Inc. uses modern equipment to clean, scrape, and wash down grease traps to remove all debris and waste material from the grease trap. Regular maintenance helps reduce the risk of clogged drains and overflows in the kitchen area. To keep grease traps functioning effectively, they should be cleaned on a regular basis. Depending on the size of your operation, the schedule varies from every two weeks, once a month, every two months, or every three months. Our trained professionals will access your degree of operation and determine which schedule is the most beneficial for your business. Service is available for traps that require servicing at greater than 3 month intervals. However, these locations are subject to scheduling availability. Flow More Sewer Services, Inc. advocates regular maintenance, especially when it comes to Grease Traps!